Need to introduce a scrambled shRNA into your cells as a control for an active shRNA? 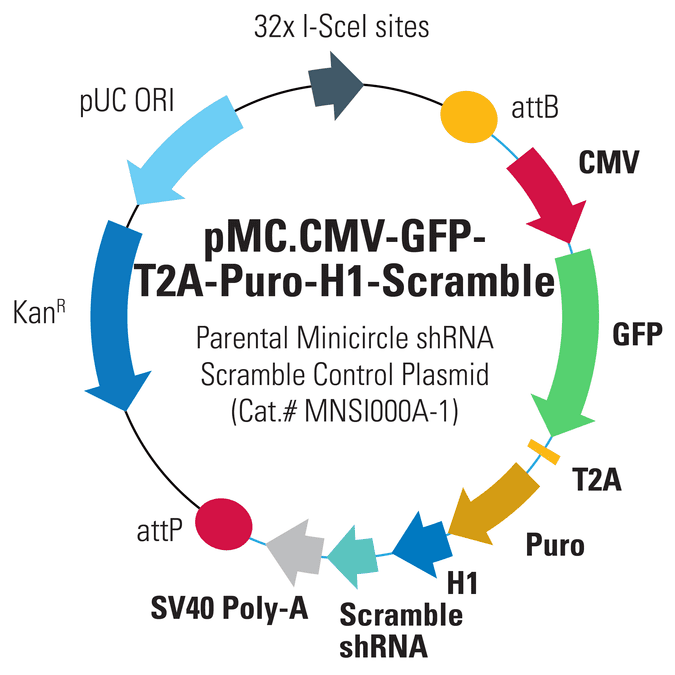 Turn to SBI’s pMC.CMV-GFP-T2A-Puro-H1-Scramble Parental Minicircle shRNA Scramble Control Plasmid which delivers a scrambled shRNA to cells in this episomal, foreign DNA-free minicircle plasmid. With the pMC.CMV-GFP-T2A-Puro-H1-Scramble Parental Minicircle shRNA Scramble Control Plasmid, the scrambled shRNA is expressed from the strong H1 promoter, and offers the ability to select for minicircle-transfected cells using GFP imaging and puromycin resistance.